Having been bit by the fly fishing bug myself I wanted to be able to share it with my young son. We enjoy our time with the crappie poles pulling bluegill out of the retention pond and want to kick it up a notch. But where to begin? 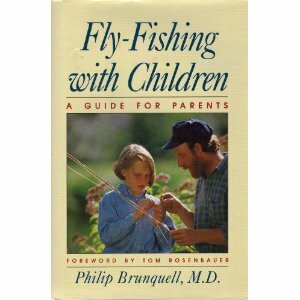 Thanks to a discussion on a fly fishing forum I stumbled upon “Fly-Fishing with Children” by Philip Brunquell, MD. Though the book was published in 1994 I think it’s perfectly relevant today. In reality I think it’s safe to say that this text is equally valuable to both youth and adults just getting their feet wet in the art of fly fishing. It’s an easy read and broken down into ten chapters: orientation, tackle, knots, outings, safety, bugs, clubs, tying, disabled children, and stewardship. There are also appendices that cover road quizzes you can use to reinforce the education you’re providing, fly patterns, and casting illustrations. I was particularly impressed with the chapters on outings and stewardship. Too many times I think that as parents we tend to jump to the end rather than moving slowly. The orientation chapter suggested more of the incremental approach that we should take when planning fishing or even practice sessions. It also provided alternatives for those off-season months. My son is very caring and even at six years old insists on catch and release and has done so since before he knew what it was. I’m looking forward to explaining more of the ways we can help ensure a bright future both in and out of the fishing arena for the environment around us. I think that’ll be a great way to hook him even further. Dr. Brunquell’s conversational style and personal stories makes this an excellent volume on bringing new blood into the fold. If you’ve been contemplating getting your child, grandchild, niece, nephew, or any young child involved in this fine art I highly suggest you pick up a copy of this book and give it a read. I think you’ll be glad you did.